Eat Your City: The Cheese Factory Edmonton, AB - home to the best poutine with squeaky curds, fried cheese and cevapi! Posted by Rating 9/10 With some new friends and a visiting friend all the way from sunny California (there's no decent places to have poutine down in California *gasp! *), so with a craving for Edmonton's best poutine, we all meet up at the Cheese Factory - directions included "look for the large yellow sign with the mouse on it". With the cheese curds made the traditional way every week - they yield with a super squeaky tweak when you bite into them.. just like the awesome cheese curds in Quebec. To read our previous review with other mouthwatering items, click here. Pictures include a few from a separate visit that I combined into this post. You can really tell when we used a camera phone (passable pics) vs a point and shoot camera (much better looking pics)... forgot the dSLR both return visits.. sorry! 3) Kefir - a fermented yogurt drink - healthy for you, but definitely an acquired taste, and we promptly dare each other to have some... what are friends for? :) To some it tasted like a thin plain yogurt, to others it had an alcoholic zing to it. You get a free glass with an order of cevapi. We quickly decide on a few favorites like the Serbian Cevapi (the current family owning the restaurant is Serbian), a Quebec classic tourtiere (meat pie), a variety of poutines and some sanganki (fried cheese) and stuffed mushrooms to round off things. Cevapi - My absolute favorite item at the Cheese Factory... I can never leave without ordering their awesome Cevapi. The grilled homemade fingerling sausages are juicy, well seasoned and have a bit of a spring and are bursting with flavor when you bite in. It pairs well with the baked slighty sweet and tender-chewy traditional flatbread and kajmat (amazing whipped buttery cream cheese like spread - made in house) and diced sweet onion. Mmmmmmmm! 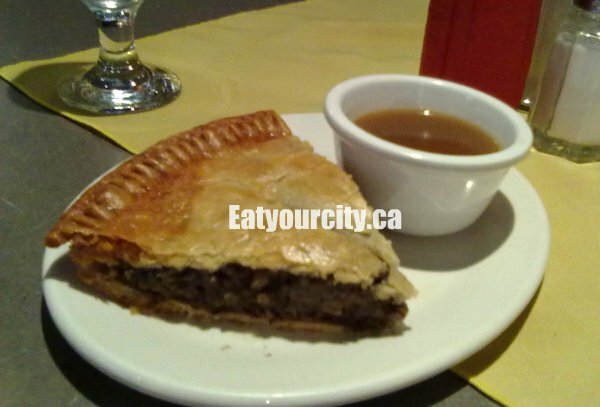 Tourtiere - A generous slice of meat pie is served with a side of gravy (same gravy used in poutine) and the mandatory squeeze bottle of ketchup/catsup. The crust was light and flaky, yet did not get soggy from the soft tender seasoned ground beef inside. The texture of the filling was a bit compressed, as if the chef wanted to pack in as much meat filling possible and still seal the meat pie shut. Still, it was a filling and savory entree. Tender small morsels of sauteed and browned ground beef, a generous handful of squeaky cheese curds float in the Cheese Factory's signature rich amber gravy atop of a tumble of crisp-soggy fries. Mmmmmm. The picture can speak for itself.. 'nuf said. We had a poutine with tomato sauce too, but we found the tomato sauce a but too runny, making the poutine really soggy (no pic). Fresh squeaky cheese curds smothered in a rich savory gravy and fries.. this time with lots of chunks of tender chicken breast and a mini mountain of sweet green peas. The peas lend a nice sweetness to the indulgently savory dish. Oh baby.. these fresh mushroom caps are packed full of cheesey, seasoned bread crumby goodness all broiled to perfection... with a layer of melted ooey gooey cheese on top. Mmmmmmm. If they tossed in some bacon bits, wow, they'd have people lining up all day, and no one would leave them alone! This molten cheesey mushroom madness is quite hot, so make sure you don't burn your tongue! Possibly one of the best fried cheeses I've had in a long time. Having the cheese made fresh on site probably didn't hurt. Lightly battered with breadcrumbs, the cheese is fried to an ooey gooey nomnomnom. You might think, whats the big deal, its just cheese, battered and fried... but once you taste it, you'll realize its not just fried cheese. These simple looking little bricks of cheese nestled upon some torn iceberg salad are well worth the visit. The bread crumb crust is delectably crisp and golden brown, while the center is a molten warm bite of very mild young white cheese. The thousand island like dressing its served to dunk the cheese into cuts the grease a bit (lemon wedges for those that want more lemon zing) and works well with the fried slabs of golden happiness. Here's a close up of the crispy appetizer after we cut it open... NOM! We didn't possibly have room for their dessert crepes, so we shared a traditional Urmasica, a baked homemade pastry soaked in traditional syrup. 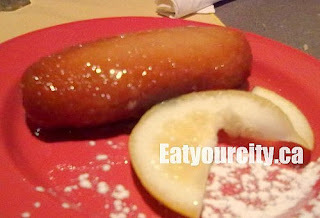 It turned out to be a dense cake like tube drenched in a pool of light sugary syrup. A bit on the sweet side, it was interesting to try and easily sharable, so everyone had a small bite or two. Overall, the best place in the city for poutine, fried cheese and delectable Cevapi... so go, indulge in a cheese-happy haven!